Field’s new book (Skyhorse Publishing, 2015) covers just about every aspect of casting, from casting light lines to distance casting to throwing heavy flies on sinking lines to trick casts for tough situations. 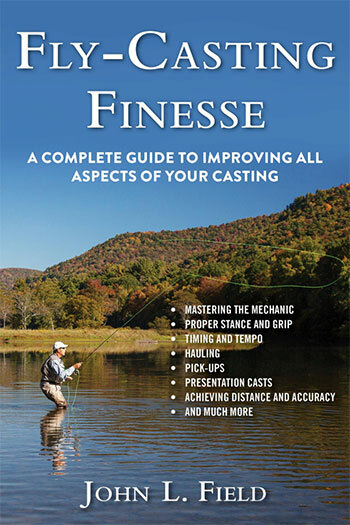 Fly-Casting Finesse: A Complete Guide to Improving All Aspects of Your Casting is an extremely useful resource for any intermediate-to-advanced flyrodder, and they will not outgrow it. I would not, however, recommend this book to beginners; it could overwhelm them and turn them to golf. There are better ways for beginners to get started, namely hands-on instruction. Two things to get out of the way: 1) Field has been a friend and fishing companion for 10-plus years. I don’t think that this colors my review, but you’ll have to be the judge of that; and 2) I am wary of guidebooks on any subject that claim to be “complete.” They never are; they can’t be. Nearly every sentence deals with some tic or nuance that you’ve already put into practice (if you’re a seriously absolute-top-notch caster, like e.g. Joan Wulff or a Rajeff brother) or that you’ve never really thought about (everyone else). Field’s descriptions of casting techniques read almost like geometry proofs or philosophical arguments, in that you have to fully understand each part for the whole to make sense. * This attests to his lifetime of study and practice in the art of casting; he doesn’t overlook what some of us may consider to be minutiae, and his instruction is the stronger for it. For example, Field discusses grip, stance, and body position in setting up for the cast, as well as body motion during the cast. This stuff is crucial to getting distance, but for most of us it’s not intuitive. Field puts it in the foreground, and your casting will be the better for it. This might sound a bit like Greek, but graphics help explain it, and practice may give you an “aha!” moment and add 10-plus feet to your longest casts. There are many more tips on using your body to make a long cast, and I bet that most of them have never occurred to you. They hadn’t to me. Field includes several sidebars (he calls them “Field Tips”) that give practical advice to brighten your days on the water. There are excellent (and under-utilized) tips on line management for when you’re fishing from a skiff. These are gems. There is something called a “corkscrew curve cast,” and learning it is going to be my next project. The book doesn’t just present a cast – say a negative curve – as a series of hand/rod motions. It explains why you’re doing what you’re doing; this is essential to improving as a caster. There’s a lot of myth busting in this book. Field talks about what works, and if something works he tells us why. If some sacred technique or practice doesn’t work, Field doesn’t just say “it’s no good;” he tells us why it’s no good. Which is interesting, up until that last sentence, because it flies in the face of what the industry tells us, which is that fast, stiff rods cast longer for everyone. Being well out of my 20s, Field’s last sentence makes me kind of sad, and so let’s just not discuss it. Some of the instruction (as in every casting book) can seem a little vague, and you’ll need to take the information here and actually put it into practice to understand what’s going on. (See *, above.) But that’s also true of books on just about every other discipline; you’re not going to learn how to surf just by reading about it. I do think that more graphics might help readers better visualize some of the concepts that are discussed here. In addition, the book would benefit from better organization and labeling: more (and more-specific) headings and subheadings would make the book’s techniques and principles easier to find and digest. These are minor nits; they do not affect the quality of the casting instruction. And plus the index, which is remarkably specific and thorough, to a large extent makes up for any lost-in-the-woods feeling. The “Presentation Scenarios” chapter uses headings and transitions to great advantage; it’s a short chapter but it is one of the book’s gold mines. I hope that future editions of the book will be structured more like that chapter. All told this is an extraordinarily thoughtful, detailed, and thorough casting manual; it’s also much more than that; it’s a pleasant history lesson on how we came to fish the fly the way we do. There is nothing like it out there. This book is absolutely full of ideas to think about, digest, and then put to use. Get out to your local park, pond, rooftop, river, bay, whatever, and follow Field’s advice; your casting will improve.